On Tuesday night Donald Trump gave a brief, tepid, and pointless televised speech about his border wall and government shutdown. The only real news coming out of the speech was Trump’s announcement that he would be meeting Nancy Pelosi and Chuck Schumer on Wednesday to discuss things. That meeting famously went terribly for Trump. Now Speaker Pelosi is dropping the hammer on him. According to Schumer, Trump slammed his fist down on the table during the meeting, yelled “bye-bye,” and stormed out. Trump’s people deny that any of this happened, but that’s undercut by the fact that after the meeting, Trump tweeted “I said bye-bye.” After the debacle of a meeting, Pelosi stepped to the microphone and ripped Trump a new one. Nancy Pelosi pointed to the hundreds of thousands of federal workers – many of whom live paycheck to paycheck – who aren’t currently getting paid, and therefore can’t cover their bills. 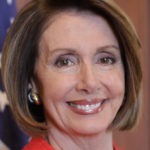 Pelosi quipped that Trump “thinks maybe they could just ask their father for more money. But they can’t.” This was in clear reference to Donald Trump’s sizable inheritance from his father Fred Trump, which he quickly squandered on his way to six bankruptcies. It’s clear that Donald Trump doesn’t have a strategy here. He gambled that he could use the shutdown to convince Americans to fund his wall before the Democrats could take control of the House and pin him down. Now he’s got no way to win, no way to save face while losing, and all he has left are empty threats and tantrums.